Les Glycines bed and breakfast. 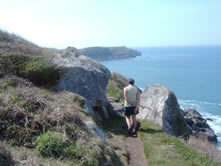 The perfect base for a walking or cycling holiday in Brittany. 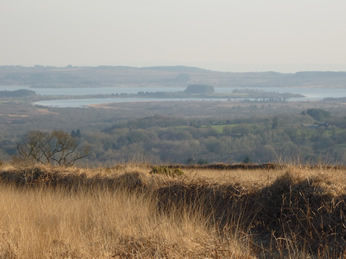 Situated in the centre of Huelgoat, close to shops, restaurants and bars, as well as Huelgoat's beautiful lake and forests. There are walks and cycle rides for everyone here: long, short, easy, difficult. Whatever you choose, each one will be beautiful. 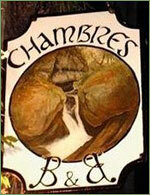 You can see neolithic menhirs (standing stones), babbling brooks, torrential rivers (seasonal! ), ancient ruins, picturesque villages and hamlets, mythological forests, three different types of coastline, lighthouses and bleak heathland, not to mention the beautiful flora and fauna. Huelgoat itself is located in extraordinary ancient woodland and provides the most impressive base camp for exploring one of the mythical forests of Brittany where the River Argent dances over and under huge granite boulders, boasting sites such as Arthur's Camp, Wild Boar Pond, The Falls, The Force and the old silver mine. You can spend several days exploring this forest. 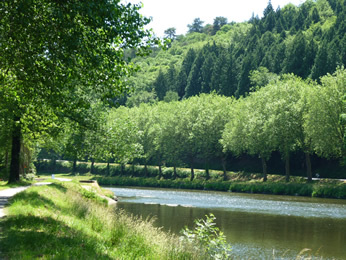 More demanding hikes or easy strolls are all within walking distance of Les Glycines. Maps and itineraries are available. The French equivalent of the Ordnance Survey map is the IGN Serie Bleue map (Institut Géographique National www.ign.fr) and these are available in most local supermarkets and 'maisons de la presse'. 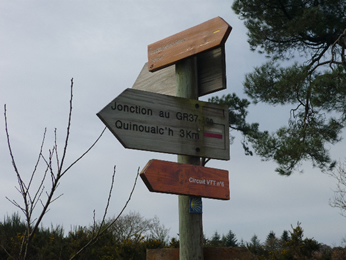 The main footpaths are designated Grandes Randonées ('GR's) and are often linear walks where you would need to either walk back the same way or arrange for transport at the other end; GR trails are generally well posted and are blazed on trees or posts with red and white markings. 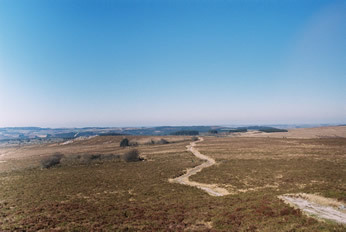 Longer but circular walks are 'GRP's and shorter and usually circular walks (up to 6 hours) are Promenades et Randonées ('PR's); these are marked in either red and yellow, denoting a regional route or only yellow indicating a local path. 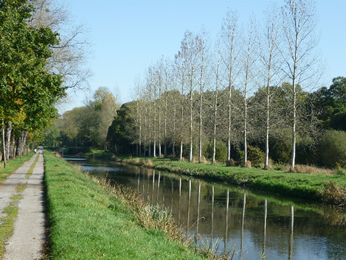 There is also the system of 'Voies Vertes' (green paths), which follow the course of former railroads and towpaths, often alongside canals and rivers, where no motorised transport is permitted. These well-maintained, fine-gravel paths provide easy walking and cycling territory and are sectioned off into manageable 'etapes' or stages. Huelgoat is just west of the main Voie Verte 1 (Roscoff Nantes) and the Voie Verte 7 (Roscoff-Concarneau). For mountain bike (VTT) enthusiasts, VTT signs are denoted by 2 dots, one above the other, in either blue, black or red to indicate the grade of difficulty, followed by a red triangle which shows direction. A series of VTT events take place each year in and around the Huelgoat forest and there are 180km of the highest altitude VTT circuits in Brittany between the Bay of Morlaix and the Monts d'Arrée (www.randobreizh.org/BasesVTTBretagne.php). 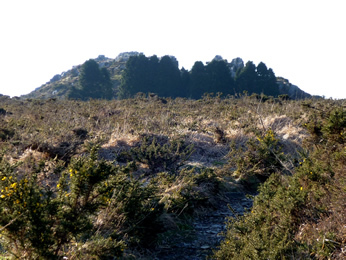 The wild heathland of the ancient massif of the Monts d'Arrée, culminating at approximately 390 metres, with amazing views over central Finistère and the reservoir of Saint Michel crouched at its base (GR380). 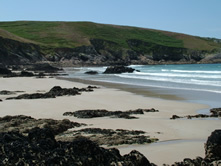 Each of these areas is within easy striking distance of Huelgoat and Les Glycines, offering a vast choice of walking territory. Walks can be easily adapted to longer hikes or more leisurely strolls, but your own transport is needed if you want to strike out further afield as means of public transport are few and far between. 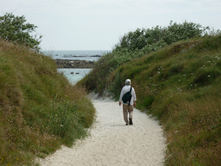 There is nowhere in Brittany that is far from the coast and the famous GR34 provides a major footpath taking in 1,200 km of the coastline. 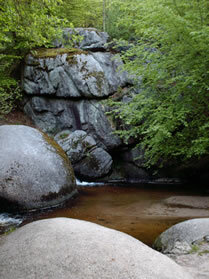 The north has striking rock formations and wide inlets, incorporating part of the famous Granite Rose coast. 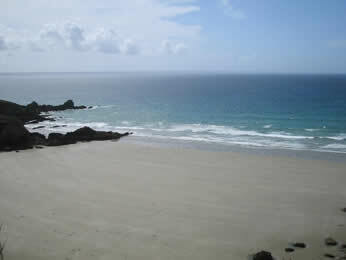 The west has steep, rocky cliffs, infinite sandy beaches and the most dramatic of Atlantic surf. 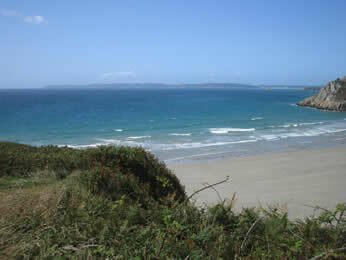 The southern coast is a gentler beauty, with many fine estuaries. We have our fair share of rain (no worse than Cumbria or Ireland), but that wont put off the intrepid. 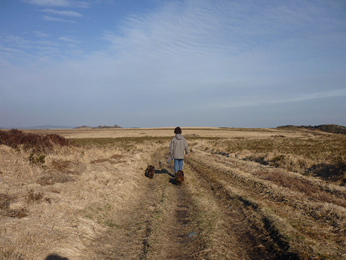 We also have some of the best walking weather out of 'season', ie. not July or August, when you can step out into a clear, crisp sunny morning and not meet a soul all day....you'll feel like the place is yours. Have you got the taste? Some walking websites to visit are: www.reddogbooks.com, www.brittanywalks.com, www.randobreizh.com, www.voiesvertes.com, www.bretagne-rando.comor contact us at Les Glycines (paolo.santoro@orange.fr) and we will be happy to advise you. Thanks to Charlene Woods, Amanda Davis and Paula Boocock for their photographic input.